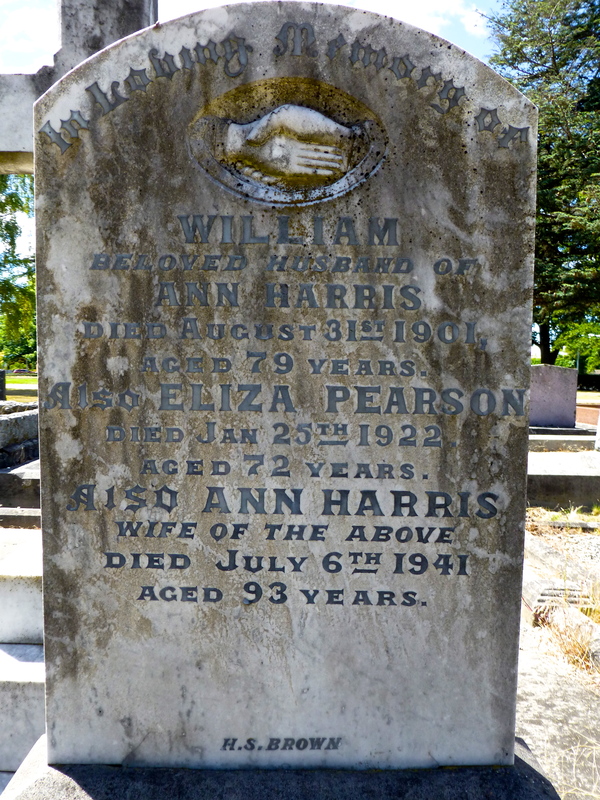 William Harris was born on 25 Oct 1829 in Hobart, Tasmania, was christened on 16 Dec 1829, and died on 31 Aug 1901 in Longford, Tasmania at age 71. In Hobart Town on 16 Dec 1829 the Reverend William Bedford baptised William Harris, son of Margaret Harris, a servant of Hobart Town. However his father was not named. Some 25 years later he had the first of four children with Ann McCoy, who arrived as a free immigrant some two years earlier. Ann was born about 1833 and arrived aboard the Coromandel on 18 Jul 1853 in Hobart Town, Van Diemen's Land at the age of just 20. Along with other immigrants, she had left Southampton on 10 Apr 1853. No trace of a marriage has been found, nor of her death, but it seems likely that she died some time between the birth of their last child, Mary Ann, in 1866 and 1880 when William re-married. When Alfred's birth on 28 Oct 1829 was registered the informant was Ann Harris (by her mark), mother of 230 Murray Street Hobart. When the births of Mary,1858, and George,1861, were registered their father was recorded as a bootmaker from Avoca. But when Mary Ann's birth was registered in 1866 her father William was a labourer from Kentishbury. 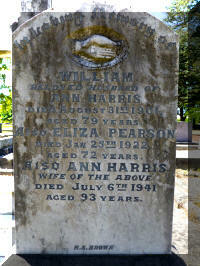 The mother was always named as Ann Harris, previously McCoy. Some time after 1866 the family moved to Pateena Road, Longford where oldest son Alfred also raised his family of 17 children until his death in 1918. William next married widow Ann Florence Medlicott, daughter of convict Thomas Medlicott and Jane Hutchinson, on 7 Jul 1880 in Launceston, Tasmania. Ann was born on 28 Jun 1848 in Bishopsbourne, Tasmania and died on 6 Jul 1941 in Longford, Tasmania at age 93. Ann married Henry Beech at Longford on 13 Jul 1864 and they had one daughter, Rebecca Jane Beech. Henry died in Hobart on 17 Apr 1880. The death occurred yesterday morning of Mrs. Ann Harris aged 93 years at the home of her only child Mrs. Harry Faulkner (of Longford). Mrs. Harris was born at Illawarra and engaged in nursing practically the whole of her life. She travelled through the Municipality with her nursing, retiring at the age of 80 years. William is buried in the Christ Church Cemetery at Longford with his second wife, Ann, along with Ann's sister.